The Sun is Back - Now What? Besides doing the Snoopy happy dance, many gardeners and farmers have some work ahead of them to restore their water-logged crops. 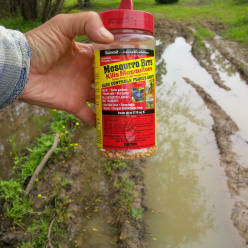 First and foremost, get those mosquito dunks and bits sprinkled out in the standing water that can't be dumped or drained. (Made by Summit - available at Eden's and just about every garden center/department I know of. Some municipalities have dunks for free.) Even along the edges of a slow moving stream, larvae can survive. Once that current slows down, they attach themselves to the surface of the water and become pupae - and then, you guessed it! Blood-sucking adult mosquitoes! Fight the Bite NOW! Roots of plants can only live so long without oxygen. Trees, mature ones anyway, and woody perennials with extensive root systems, can withstand flooding conditions longer than say, your squash plants. So, for starters, let's work on getting some air to the root systems of your annuals. The soil is going to be too wet and heavy to use any kind of actual equipment, so a garden fork and your boot are your best bet right now. Just work a garden fork back and forth a bit along the edge of the rows, careful not to dig up the roots, but enough to allow some air pockets. The air is nice and dry right now so evaporation should occur pretty fast. The wind will help dry out the surface of the soil as well. However - we don't want crusting to occur either, especially if we need to re-seed anything lost; so a light layer of mulch, over the top of your rows - after you've aerated with a garden fork - will help keep the soil from forming a hard crust. This is important, too, to keep down the weeds that will be germinating - because they got watered, too. Next up, I would consider a foliar application of fertilizer. Maestro Gro makes an excellent fish and seaweed formula that I use here at the farm. To it, I would also suggest adding some recently harvested compost or worm casting tea that has been aerated for about 24 hours. You can make your own, or buy some from local our resident worm rancher, Texas Worm Ranch. One of the things that all of this rain has done, is leach nutrients, bacteria and fungi through the soil. We need to help restore these things, in order to help our plants recover in time to produce. Using a living compost or worm tea, will help do this quickly. In a natural setting, many plants may die back and others take their places or we can seed with a cover crop and use another field that perhaps didn't flood. But in Texas, we don't have a lot of time left for some of the summer favorites to go from seed to fruit again - our extreme summer temps will likely be here before we know it. Inspect your plants closely for pressure from insects. I've been trying to stay ahead of the squash vine borer and squash bugs - but with less than 24 hours between rain events this past month, it's been a little tricky to use anything short of squishing. In extreme or extended flooding conditions where your crops are very anemic, pale and close to being lost, you might try a product called Hasta-Gro. Now for the purists, I'll may get some grief because it does contain clean urea sources although it is complexed with humic acid, not ammonium nitrate. I feel that if you have a generally healthy soil, and use it only sparingly when a soil fertilizer isn't going to work, such as when soil is saturated, you're still being a good steward of your soil. You can abuse urea fertilizers, and of course I do not advocate for the harsh, dry applications often mixed with Ammonium Nitrate. They can strip soil and damage the biology more than help it. But for a transition from synthetic fertilizers or a quick, infrequent, water soluble shot in the arm for plants in stress, I think it is fine. I would get your foliar feed out today - if possible - or early in the morning before you take off for work. The sooner you can help your plants recover, the better. 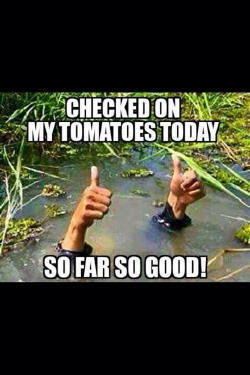 I've seen a lot of folks concerned about their gardens this week. I hope this quick entry helps! I'm headed back outside - hope you 'git your hands in the dirt' soon!